Kimberlite is very difficult to recognize. It is basically a potassic peridotite and comes in a variety of colors and textures. Most notable is green kimberlite due to abundant serpentinized olivine. It typically erupts from a feeder dike complex at depth and rises to a pipe-like structure known as a diatreme and blows out at the surface like a canon under great pressure. Hypabyssal facies kimberlite, Masontown, Pennsylvania. This kimberlite dike is enclosed by black shale. Kentucky, known as basaltic kimberlite. Snap Lake hypabyssal facies kimberlite, Fort Smith, Canada. Diamond-bearing diatreme facies kimberlite breccia from Lake Ellen, UP, Michigan. IG3 Kimberlite from Iron Mountain. Another tuffaceous kimberlite. The Ferris 2 kimberlite from Wyoming. Large fractured chromian diopside (chrome diopside gemstone) megacryst in Sloan 2 kimberlite from Colorado. Gemstones like this are typically not recovered from diamond mines even though they are as beautiful as any emerald. 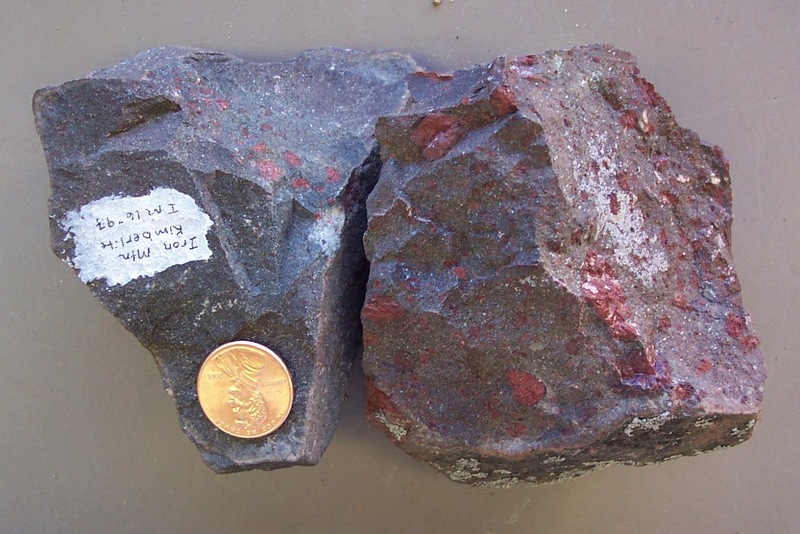 Kimberlite from the Victor pipe in Canada. Wyoming – The Gemstone State. Precious stones Copyright © 2018.